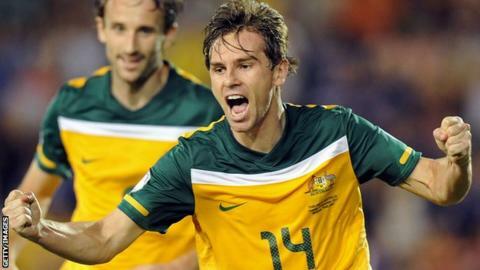 Aston Villa have agreed a deal to sign Australia international Brett Holman from Dutch club AZ Alkmaar this summer. The 27-year-old winger, who has won 53 caps, was named as Australia's football writers' Player of the Year for 2011. Holman, who joined Eredivisie leaders Alkmaar in 2008, will sign on a free transfer when his contract expires. "I am delighted to have agreed terms with Aston Villa. I am looking forward to joining up with the team in the summer," said Holman. "Villa have a long and prestigious history in English football and a fantastic set of fans." Holman has spent a decade in the Netherlands, having had spells at Feyenoord, Excelsior and NEC Nijmegen before moving to AZ. "Brett is a very intelligent player," said Villa manager Alex McLeish. "A great team player and a man who is recognised in the game as a non-stop, committed wide midfield player. "He has international experience and has played in the Champions League. He will add significantly to the experience in the Villa squad."